The IHA Swim team huddles together for its team chant at the start of the state championship meet. IHA won the title over Bishop Eustace at TCNJ on Sunday, February 22nd with a final score of 108-62. 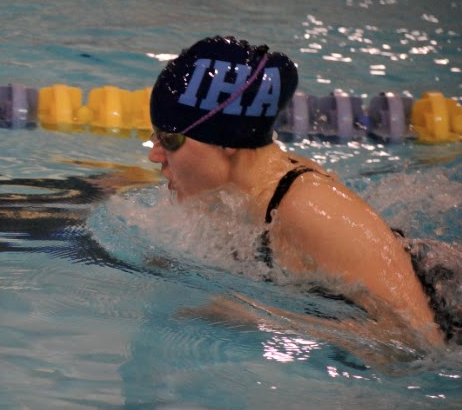 The IHA Swim team was on the bus and ready to face Bishop Eustace bright and early last Sunday, hoping to earn the title of state champions for the 8th consecutive year. On Sunday, February 22nd, parents, family and friends traveled to TCNJ to watch and cheer on the swim girls as they took on their Non-Public Division A state title. The girls gathered around anxiously and excitedly. Some members have swum in the state meet for four consecutive years, while others were about to swim for the first time, not knowing what to expect. When a group of girls come together from all over, whether they swim on a club team or just swim for school, it’s the girls that make the team a family—not their times. Junior Laura Lobst swims the last lap of the 100 meter breast stroke in the championship meet. “To take part in states was an extremely cool feeling because I am a part of such an amazing team. The best part was not winning, but being apart of a team and a family and seeing everyone rooting for you,” said junior Laura Lobst who swam the 100-breast stroke with a time of 1.16. Junior Jill Calocino led the team in the 100-yard butterfly (58.17) and came in second in the 500-freestyle (5:10.13). Calocino also helped in the win of the 200-medley relay (1:51.13) and 400 free-relay (3:41.32). Calocino finished in second in the 500 free behind Lauer who collected a win earlier in the meet in the 200 free (1:55.37). Lauer also took part in the winning 200-free relay (1:42.16), along with sophomore Kim Caccamo, senior and captain Kelly Czochanski, and freshman Kate Sheridan. Junior Kristin Kunnapas and Senior Captain Megan Rice are all smiles after earning another state title for the IHA Blue Eagles. 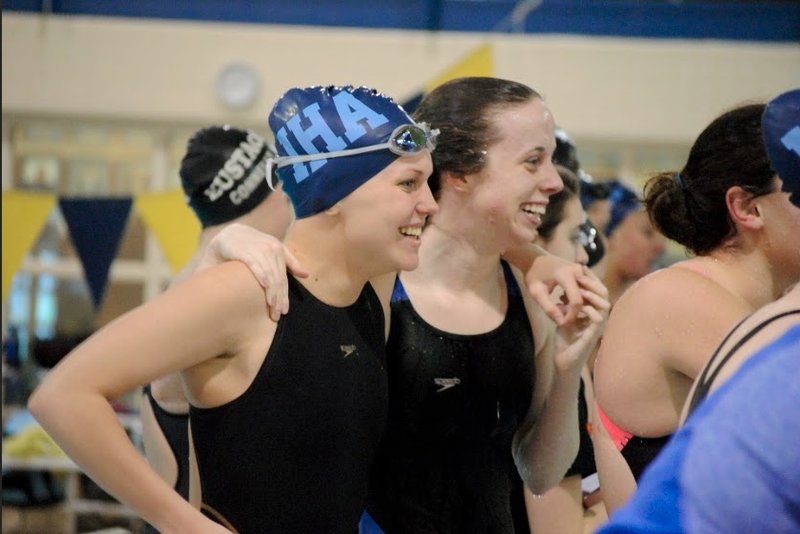 “I’d say the best part was at the end of the meet, coming together getting that trophy and saying we won another state championship,” said freshman swimmer Catherine Fazio. “It was an extremely happy and proud moment, especially for the seniors, I’m sure” said sophomore Amanda Lauer after she and her team won 108-62 over Bishop Eustace, and ended the season undefeated. The IHA Blue Eagles are looking forward to another great season next year, and hope to bring home more trophies and championship wins.